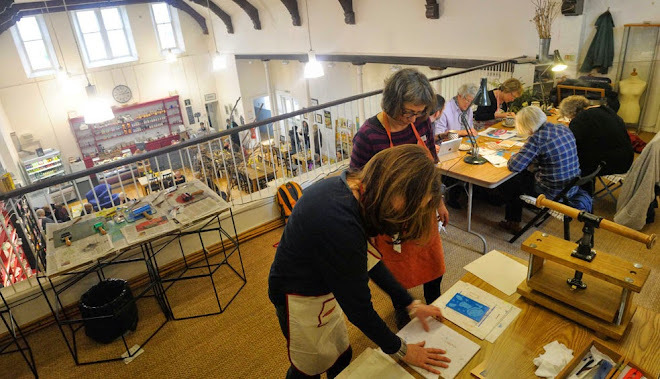 The planned Clare Melinsky print workshop for next Monday November 19th has been postponed until February, when Clare will be running four new sessions. The February workshops cost £50 including lunch in our cafe, and morning and afternoon refreshments. Clare will help you design your own works of art. The workshop dates are: Friday 1st, Saturday 2nd, Saturday 9th and Tuesday 12th February 2013. Beginners and returning students are welcome; minimum age 16; only six students per session. And if you are stuck for a Christmas present idea: a workshop could make a great gift for a friend or relative. Ring 01848 331 553 to book a place. Or email: info@thomastosh.com.